For the downloadable episode "Burial at Sea" for BioShock Infinite, see BioShock Infinite: Burial at Sea. Burial at sea is the disposal of human remains in the ocean, normally from a ship or boat. It is regularly performed by navies, and is done by private citizens in many countries. Burial-at-sea services are conducted at many different locations and with many different customs, either by ship or by aircraft. Usually, either the captain of the ship or aircraft or a religious representative (of the decedent's religion or the state religion) performs the ceremony. The ceremony may include burial in a casket, burial sewn in sailcloth, burial in an urn, or scattering of the cremated remains from a ship. Burial at sea by aircraft is usually done only with cremated remains. Other types of burial at sea include the mixing of the ashes with concrete and dropping the concrete block to form an artificial reef such as the Atlantis Reef. Below is a list of religions that allow burial at sea, with some details of the burial. There are very few traditional Buddhist burials at sea. Traditionally, the deceased are cremated and the ashes are placed in a grave or columbarium. Particularly in East Asian or Mahayana Buddhism, a physical gravesite is considered important for the conduct of memorial and ancestor rites. The Buddhist Churches of America, the North American branch of Japanese Jodo Shinshu Buddhism, has created a service for Buddhist burials at sea, primarily for military service members. In Thailand ashes are generally placed in a wreath with lit candles and floated off to sea from a vessel followed by a procession of mourning wreaths, with lit candles also. Officially, the Roman Catholic Church prefers normal casket burials over cremations, but does allow for cremation subject to the condition that the ashes are entombed or buried. Catholics believe it is not proper to scatter or pour the cremated remains over the sea, water, or on the land. According to the Roman Catholic Church this action does not give due respect to the remains of the deceased, nor does it allow for the closure and healing of family and friends. Likewise they see that the custom of housing the remains with family or friends and not placing the deceased in the ground does not offer loved ones a specific and sacred place to visit the individual. Visiting the deceased in a holy place provides believers with a space to offer prayers, commune with those who have gone before them in faith, and reminds them to await the resurrection of their own bodies. Burial at sea in a casket or in an urn is approved for cases where the deceased expired in the sea. The committal prayer number 406§4 is used in this case. Unto Almighty God we commend the soul of our brother departed, and we commit his body to the deep; in sure and certain hope of the Resurrection unto eternal life, through our Lord Jesus Christ; at whose coming in glorious majesty to judge the world, the sea shall give up her dead; and the corruptible bodies of those who sleep in him shall be changed, and made like unto his glorious body; according to the mighty working whereby he is able to subdue all things unto himself. Many Lutheran naval veterans and seamen prefer to be buried at sea. In those cases either the casket or urn is set to sea, or ashes scattered. The procedure is similar as that with the Anglican church. Some parishes have specific consecrated sea areas where ashes can be sprinkled. Traditionally, the deceased are cremated, the bones and ashes are collected, and the ashes/remains are immersed in the Ganges River if possible or in any other river if not. The sacred texts of Islam prefer burial on land, "so deep that its smell does not come out and the beasts of prey do not dig it out". However, if a person dies at sea and it is not possible to bring the body back to land before decay, or if burial at land becomes impossible, burial at sea is allowed. A weight is tied to the feet of the body, and the body is lowered into the water. This would preferably occur in an area where the remains are not immediately eaten by scavengers. It is best to bury him (the deceased) in the cemetery ... If someone dies on a ship and it is impossible to bury him on land, the body is placed (O: tightly lashed) between two planks (O: to obviate bloating) and thrown into the sea (O: so that it reaches shore, even if the inhabitants are non-Muslims, since a Muslim might find the body and bury it facing the direction of prayer (qibla)). According to Jewish law, a dead person must be quickly buried and burial requires covering in earth. This law is derived from Devarim (Deuteronomy) 21:23 "Bury, you will bury him the same day; for the (unburied body) is a curse to God" the double command to bury causing a positive commandment to entomb in the earth and a negative commandment forbidding leaving an unburied body. The legal text Shulchan Aruch brings a case example explaining that even if a person is known to have drowned in a closed body of water such as a small pond where there can be certainty that the victim had not somehow survived, the family does not begin ritual mourning and remains in extended state of most intense mourning aninut until either the body is found or after an exhaustive search despairs of recovering and burying the body. This shows that the body is considered unburied when underwater; as shiva mourning normally only begins after burial. B'resheit(Genesis) 3:19 states "With the sweat of your face you shall eat bread, until you return to the ground, from (dust) you were taken and you are dust, and to dust you will return." From this we see that the only proper treatment of a dead body is to physically cover it with earth once land is available for the crew to bury the body, rather than to leave the body at sea or some other fate such as cremation. If for some reason the body of someone deceased aboard a ship causes an immediate life threat to those aboard the vessel the commandment to protect innocent life or pikuach nefesh overrides nearly all commandments including the command to bury the dead, as any appropriate actions to ensure safety of surviving crew are required to be taken which may include jettisoning a body at sea without burial. However, attempts would later be made to recover and bury when possible without life hazard. An example of the desire to bury a body in the ground even after it has been long dead at sea, is that of the Israeli submarine Dakar which was lost with no survivors in 1968 but was only discovered in 1999 lying broken at a depth of 3,000 meters. Search and recovery of any potentially existing remains at this very difficult to access depth has not shown results despite requests from family and the Chief Rabbi of the IDF. In another case Jewish rabbis, after finding of the remains of Holocaust victims using a new penetrating sonar technology, called for a proper Jewish burial claiming that many of these martyrs were adherent to traditional Jewish law themselves and would insist on being removed from a river, where Nazis had dumped them en masse, to rest in a proper in-earth Jewish burial. Burial at sea within Australian territorial waters, exclusive economic zone and continental shelf is covered by the Environmental Protection (Sea Dumping Act) 1981 administered by the federal Department of the Environment. A permit is required for burial of bodies at sea. Permits are usually only granted in cases of a strong connection to the sea, such as long-serving navy personnel. The body must not be embalmed or placed in a casket, it may only be sewn into a weighted shroud. The burial must be in water deeper than 2,000 metres (6,600 ft) and not interfere with shipping, fishing or undersea communications. Australian Defence Force vessels engaged in armed conflicts or emergency situations are exempt from these requirements. No permit is required to scatter ashes at sea. Burial at sea was a method hypothetically suggested by the then Medical Officer of Health for Liverpool, Dr Duncan Dolton, in which unburied bodies could be buried at sea during any extended strike by gravediggers union the GMWU during the 1978–79 Winter of Discontent. The suggestion caused great alarm amongst the public and helped prompt a resolution to the strike. British colonial burials at sea of the 18th and 19th century involved wrapping the deceased in sailcloth weighted with cannonballs. In England, cremated remains may be scattered freely at sea but a burial must be made in a coffin meeting regulatory requirements and in one of three locations: off The Needles, Isle of Wight; between Hastings and Newhaven; and off Tynemouth, North Tyneside. Permission may be sought for another burial site. Some funeral directors will arrange the event, and the Britannia Shipping Company specialises in it. Charity organisation the Maritime Volunteer Service also helps carry out burials at sea. In Scotland, there are two designated sites for burial at sea. These are 210 miles due west of Oban and 15 miles west of John O'Groats. A funeral director is not required for the burial of cremated remains at sea. However, full body burials require specific preparation to ensure the body or coffin sinks quickly, and in many states a licensed funeral director is required. The Environmental Protection Agency regulations for full body burials at sea in the United States require that the site of interment be 3 nautical miles (5.6 km; 3.5 mi) from land and at a depth of at least 600 feet (180 m). California prohibits whole body burial within its state-asserted three-mile limit. Off the eastern coast of the United States, the closest sufficient depths are off Long Island (75 miles/121 km), Ocracoke (20 miles/32 km), and Miami (5 miles/8.0 km). This may require travel in excess of 30 miles (48 km) for a suitable site. Departing from the New England area requires a voyage of about 45 miles to reach the required 600 ft ocean depth. Sufficient depth is within 10 miles or less at many harbors along the U.S. west coast, including San Diego, Santa Barbara, Monterey, Fort Bragg, Eureka, and Crescent City, all in California. The United States Navy inters intact remains from Norfolk and San Diego only. 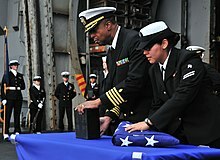 The United States Navy requires a metal casket for intact remains, but full body burial in a suitably weighted shroud is also legal. The United States is similar to many countries which permit the spreading of cremation ashes within their Exclusive Economic zone: when spreading ashes from a ship which is registered in a different country, the regulations and reporting procedures for the ship's flag state need to be complied with once the vessel is in international waters, that is, outside 12 nautical miles. Ships follow the London convention principles, as opposed to MARPOL regulations, as the ash is intentionally taken on board for discharge at sea, as opposed to ash generated on passage from the ship's incinerators. It should be further considered that on 1 January 2013, MARPOL Annex V came into force, which prevents discharge of a ship's incinerator ash. 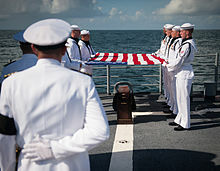 The United States Navy has performed many burials at sea in its history, with wartime burials as recently as World War II, and peacetime burials still common. Enemy deaths received the same ceremony as Americans or allies. Most other armed forces also perform burials at sea, such as the British Royal Navy and the Royal Canadian Navy. In preparation, the officer of the deck calls All hands bury the dead, and the ship is stopped (if possible). The ship's flags are lowered to half mast. The ship's crew, including a firing party, casket bearers and a bugler, are assembled on the deck. The crew stands at parade rest at the beginning of the ceremony. The coffin is covered with a flag, and is carried feet first on deck by the casket bearers. The casket is placed on a stand, with the feet overboard. In case of cremated remains, the urn is brought on deck and placed on a stand. The ceremony is divided into a military portion and a religious portion. The religious part is specific to the religion of the deceased, and may be performed by a Navy chaplain, or by the commanding officer if no chaplain of the appropriate faith is available. A scripture is read and prayers are said. After the religious ceremony, the firing party is ordered "Firing party, present arms". The casket bearers tilt the platform with the casket, so that the casket slides off the platform into the ocean. The flag which was draped over the casket is retained on board. For cremated remains, there is the option to bury the remains using the urn in a similar fashion to the procedure used for caskets. Alternatively, the urn can be opened, and the remains scattered in the wind. In this case, the wind direction has to be taken under consideration before burial to ensure a smooth procedure. The firing party fires a three volley salute, the bugler plays Taps, and flowers may also be dropped into the ocean. After the flag is folded, the ceremony ends. The relatives are informed of the time and location of the burial, and given photos and video recordings if available. In wartime, attempts are made for burial at sea to follow the same procedure as for peacetime burial at sea, although a ship on a combat mission may not have all the necessary resources available. Nowadays, it is usually possible to airlift the remains back to shore, and prepare a burial ceremony on land. However, as recently as the Falklands War, deceased were buried at sea without returning to land. Due to the limited facilities of military ships, this procedure usually does not include a casket, but the body is sewn into a sailcloth with weights, usually rocks or cannonballs. Cremation is usually not possible on a ship. During the Pacific campaign there was at least one instance where a member of an aircrew was buried at sea in his damaged aircraft, which was ceremonially pushed overboard from an aircraft carrier. If no remains of the deceased are available a memorial service may be held, and flowers may be dropped in the water, often over or near the location of the death. Andrew Cunningham, 1st Viscount Cunningham of Hyndhope (1883–1963), prominent admiral of the Royal Navy during World War II. Buried at sea near Portsmouth. Dame Edwina Mountbatten, Countess Mountbatten of Burma (1901–1960), was buried at sea off the coast of Portsmouth, as it was her wish to be buried at sea. Mariano Moreno (1778–1811), one of the leaders of the Argentine May Revolution; died on voyage to the United Kingdom, possibly poisoned; his coffin was wrapped in a British flag. Adolf Eichmann (1906–1962), following his execution in Israel, his body was cremated and his ashes scattered at sea over the Mediterranean, in international waters. This was done because Israel did not want such a person buried in its soil, and also did not want a grave elsewhere that might have become a place of pilgrimage for other Nazis. Osama bin Laden (1957–2011); one U.S. official stated that "finding a country willing to accept the remains of the world's most wanted terrorist would have been difficult". It was also done to prevent his burial place from becoming a "terrorist shrine". Liu Xiaobo (1955–2017), 2010 Nobel Peace Prize Winner, ashes scattered into the ocean off north-eastern China. Stephen Hillenburg (1961-2018), creator of SpongeBob SquarePants, ashes scattered 500 yards off California coast. Wikimedia Commons has media related to Sea burials. ^ Shulchan Aruch, Yoreh Deah 362:1. ^ Leviticus 18:5 "אֲשֶׁר יַעֲשֶׂה אֹתָם הָאָדָם וָחַי בָּהֶם"
^ "Israel tries again to solve mystery of sub lost in '68". baltimoresun.com. Retrieved 5 April 2018. ^ Guttman, Nathan (2 February 2003). "NASA Says Remains of All 7 Astronauts Recovered, Then Retracts". Retrieved 5 April 2018 – via Haaretz. ^ Bochner, Uri Dotan. "Search and Discovery of the Israeli Submarine Dakar". submarines.dotan.net. Retrieved 5 April 2018. ^ "Environmental Protection (Sea Dumping Act) 1981". Australian Government. ^ "Burial at sea". Retrieved 30 August 2015. ^ "The Britannia Shipping Company For Burial At Sea". Retrieved 25 September 2018. ^ "Burial at sea: Seven things you might not know". Retrieved 25 September 2018. ^ "Burials at Sea". Scottish Government. Retrieved 23 July 2018. ^ a b c "New England Burials at Sea - Ash Scatterings at sea - Full Body Sea Burials - Eco Friendly Sea Burials- Burial Shrouds - USCG Licensed Captain - Burials at sea - Sea Burials". www.newenglandburialsatsea.com. Retrieved 5 April 2018. ^ "Federal Register, Volume 40, Section 229.1". ^ staff, US Navy web. "The U.S. Navy". www.navy.mil. Retrieved 5 April 2018. ^ "In memory of Loyce Edward Deen USNR WW II, (1921 - 1944) and all who served aboard the USS Essex". ^ "U.S. Navy TBF Avenger gunner from USS Essex is buried at sea with his aircraft during World War II". Criticalpast. 5 November 1944. ^ "Heinlein Society". www.heinleinsociety.org. Retrieved 5 April 2018. ^ "Vincent Price (1911–1993) - Find A Grave Memorial". findagrave.com. Retrieved 5 April 2018. ^ "Robert Mitchum (1917–1997) - Find A Grave..." www.findagrave.com. Retrieved 5 April 2018. ^ "Sir Edmund Hillary takes final voyage, ashes scattered at sea". The New Zealand Herald. 29 February 2008. Retrieved 22 September 2011. ^ "Osama bin Laden's body buried at sea". 2 May 2011. ^ "Yahoo report". yahoo.com. Retrieved 5 April 2018. ^ "Neil Armstrong's remains committed to the sea". CNN. 14 September 2012. Retrieved 15 September 2012. ^ Phillips, Tom (15 July 2017). "Liu Xiaobo: dissident's friends angry after hastily arranged sea burial". the Guardian. Retrieved 5 April 2018. A funeral is a ceremony connected with the burial, cremation, or interment of a corpse, or the burial with the attendant observances. Funerary customs comprise the complex of beliefs and practices used by a culture to remember and respect the dead, from interment, to various monuments, prayers, and rituals undertaken in their honor. Customs vary between cultures and religious groups. 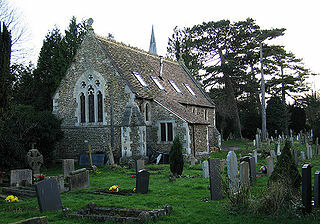 Common secular motivations for funerals include mourning the deceased, celebrating their life, and offering support and sympathy to the bereaved; additionally, funerals may have religious aspects that are intended to help the soul of the deceased reach the afterlife, resurrection or reincarnation. Cremation is the combustion, vaporization, and oxidation of cadavers to basic chemical compounds, such as gases, ashes and mineral fragments retaining the appearance of dry bone. Cremation may serve as a funeral or post-funeral rite as an alternative to the interment of an intact dead body in a coffin or casket. Cremated remains, which do not constitute a health risk, may be buried or interred in memorial sites or cemeteries, or they may be retained by relatives and dispersed in various ways. Cremation is an alternative in place of burial or other forms of disposal in funeral practices. Some families prefer to have the deceased present at the funeral with cremation to follow; others prefer that the cremation occur prior to the funeral or memorial service. Burial or interment is the ritual act of placing a dead person or animal, sometimes with objects, into the ground. This is accomplished by excavating a pit or trench, placing the deceased and objects in it, and covering it over. Most would agree that humans have been burying their dead since shortly after the origin of the species. Burial is often seen as indicating respect for the dead. 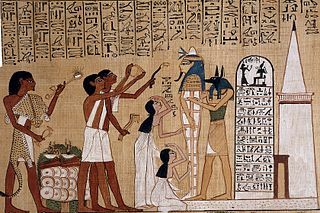 It has been used to prevent the odor of decay, to give family members closure and prevent them from witnessing the decomposition of their loved ones, and in many cultures it has been seen as a necessary step for the deceased to enter the afterlife or to give back to the cycle of life. A coffin is a funerary box used for viewing or keeping a corpse, either for burial or cremation. Embalming is the art and science of preserving human or animal remains by treating them to forestall decomposition. 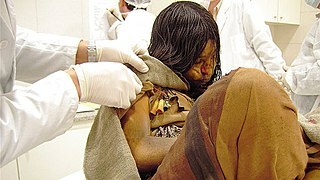 The intention is usually to make the deceased suitable for public or private viewing as part of the funeral ceremony, or keep them preserved for medical purposes in an anatomical laboratory. The three goals of embalming are sanitization, presentation, and preservation, with restoration being an important additional factor in some instances. Performed successfully, embalming can help preserve the body for a duration of many years. Embalming has a very long and cross-cultural history, with many cultures giving the embalming processes a greater religious meaning. A Japanese funeral includes a wake, the cremation of the deceased, a burial in a family grave, and a periodic memorial service. According to 2007 statistics, 99.81% of deceased Japanese are cremated. A military funeral is a memorial or burial rite given by a country's military for a soldier, sailor, marine or airman who died in battle, a veteran, or other prominent military figures or heads of state. A military funeral may feature guards of honor, the firing of volley shots as a salute, drumming and other military elements, with a flag draping over the coffin. An urn is a vase, often with a cover, that normally has a somewhat narrowed neck above a rounded body and a footed pedestal. Describing a vessel as an "urn", as opposed to a vase or other terms, generally reflects its use rather than any particular shape or origin. The term is especially often used for funerary urns, vessels used in burials, either to hold the cremated ashes or as grave goods, but is used in many other contexts; in catering large vessels for serving tea or coffee are often called "tea-urns", even when they are metal cylinders of purely functional design. Large sculpted vases are often called urns, whether placed outdoors, in gardens or as architectural ornaments on buildings, or kept inside. A Christian burial is the burial of a deceased person with specifically Christian ecclesiastical rites; typically, in consecrated ground. Until recent times Christians generally objected to cremation because it interfered with the concept of the resurrection of the body, and practiced inhumation almost exclusively. Today this opposition has all but vanished among Protestants. Catholics are now able to be cremated also, and this is rapidly becoming more common, but the Eastern Orthodox Churches still mostly forbid it. 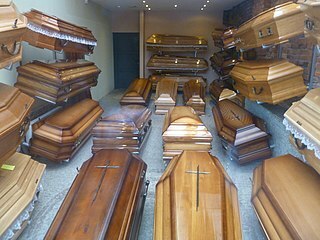 Today, cremation is an increasingly popular form of disposing of the deceased. This is true even in the Christian world, which for many years was opposed to cremation but has come to a greater acceptance of cremation over the past century. Following the death of Osama bin Laden (1957–2011), he was buried at sea. One U.S. official stated that "finding a country willing to accept the remains of the world's most wanted terrorist would have been difficult." It was also done to prevent his burial place from becoming a "terrorist shrine". During the Pre-Hispanic period the early Filipinos had already believed in a concept of life after death. This belief in an afterlife prompted the Filipinos to create burial customs and beliefs to somehow honor the dead through rituals. Due to different cultures from different part of the Philippines, many different burial practices have also emerged from the different tribes. For example, The Manobos had to bury their dead in trees, the Ifugaos had to seat their corpse on a chari before it was brought to a cave and buried elsewhere. The present day Filipinos had retained the belief of life after death from their ancestors. Which is why it is only customary for the present day Filipino to also honor the dead through different practices. Most prominent practice of honoring the dead is by holding a wake as way for the loved ones to properly mourn the death of one that is dear to them. Most Filipino Christians hold the wake at the funeral homes but others also hold them at their own household wherein the wake would be held for three to seven days and the family members would be required to wear either black or white during the procession. Unlike their Christian brethren, Filipino Muslims are required to bury the dead 24 hours after the time of death. This custom dates back to when the spread of disease was a prominent risk, the Muslims prompted to bury the corpse as soon as possible for sanitary reasons such as avoiding the widespread disease that could come from the rotting corpse. One thing that would be common between these two systems is that both practices believe in mourning even after the burial. In the case of Filipino Muslims, the mourning period lasts 40 days, during which they are required to wear black clothing. Filipino Christians have the "waksi", or death anniversary, and mourning on the 40th day. Thai funerals usually follow Buddhist funerary rites, with variations in practice depending on the culture of the region. People of certain religious and ethnic groups also have their own specific practices. Thai Buddhist funerals generally consist of a bathing ceremony shortly after death, daily chanting by Buddhist monks, and a cremation ceremony. Cremation is practised by most peoples throughout the country, with the major exceptions being ethnic Chinese, Muslims and Christians.